Behind Kentucky Route Zero there’s Cardboard Computer‘s (i.e. 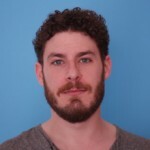 Jake Elliott, Tamas Kemenczy and Ben Babbitt) interesting reality that already had us at A House in California, authentic abstract poetry about childhood memories, in which the possible interactions are, for instance, “remember the moon” or “write some clouds”. This is the field of the so called artistic videogames, an often uneven and complex territory, but capable of some small masterpieces. I’m not scared to call this game a masterpiece: that’s what it is. One step at the time though. Kentucky Route Zero was born as a crowdfounding (with a relatively low 6500$ goal), somehow a forerunner in its genre. The creators wanted a new way to conceive graphic adventure: it’s a point and click, in which you can explore the environment by clicking your mouse, but free from the typical riddle mechanisms, focusing on atmosphere, plot and expression instead. Twilight. The continous, placid sound of cars. A gas station dominated by the gigantic head of a horse. An old truck is parking. Getting out of it, a man followed by his dog, “they both have seen better times”. The man is Conway, an antique store’s errand boy, dealing with a delivery for an address unknown to him. He’s looking for direction. From this preamble the game slowly lead us into a universe apart, a neverending night in which rurality overlaps with magic and surreal and life experiences. In which, along the road, distant shadows seem to spy us and we meet people who always have a long story to tell us. In which debts changes you more than you could imagine. In which this paradoxical world follows the placid rhythms of a man no longer in his prime. That’s the magic realism of Route Zero we are inevitably leaning toward. In this regard, this game was compared – in most of the reviews – to David Lynch’s style. The parallel is clear at first glance. The unattainable, paradoxical lost highway, whose entrance is seen through the screen of an antiquated television. And these odd, enigmatic encounters recalling the collective memory that Twin Peaks has come to be. And yet the parallel could turn out counter-productive. The term lynchian, whenever it’s not just about pure atmosphere, is an obvious limitation for a work with an other scope. We find, along Route Zero, a deep humanity beating below every surreal element. An emphaty for and between this marginal experiences that has little to do with Lynch’s work. It’s the cornestone of every event and action. This empathy explodes in the song scene at The Lower Depths tavern. There’s this strange pair of bikers who change the setting and their own appearences while singing their song. This scene alone (which I will not describe, because I have to let it surprise you) is worth the whole game. To me, it felt like a personal gift: I downloaded the track on my mp3 player and then listened to it at night, giving those moments a lividly magical taste. Interesting how we find this scene – an actual climax – only in the 3rd act. Kentucky Route Zero follows cinematic rhythms, or better, narrative rhythms, introducing, developing, varying, growing one step at the time. Something highly original for the videogame format, which is usually focused on an immediate gameplay immersion. The importance of the narrative is the true soul of this piece. We notice this since the first dialogue, in which the information comes step by step, between the uncertain and suggestions, fueling our imagination so to transform these quick brush strokes into a full cosmo. We are certain of it when we go near the dog following us and we have to choose, through dialogue, not just his name or his relation with Conway but, as a consequence, his own behaviour. Through dialogues we build the characters’ stories, we define who they are, we give them dreams. We decide an environment atmosphere by establishing what feelings it gives to our characters. The forest of illusions can be a dark creepy place or a thrilling, magical place. What’s great is that there is no practical purpose to this, it doesn’t change the itinerary or any concrete element. What is important to the creators has nothing to do with the mechanical pragmatism of games with multiple choices – which shouldn’t be important to us either. Instead we should look for our personal way to immerse in Route Zero and its universe. 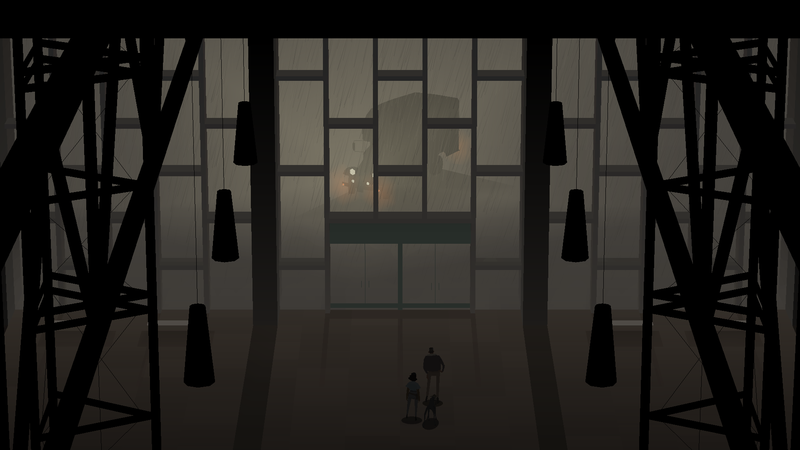 Kentucky Route Zero gives the power back to words. The power to evoke images, to evoke other words which allow to imagine what’s not said, to give life to the voices of other people’s experiences. It’s funny how some critics compared this framework to Telltale’s The Walking Dead, but fortunately this is a whole other story, much more similar to the wonderful Elegy for a Dead World‘s open narrative experiment. Not undestanding this means lacking the necessary imagination to fully enjoy this game. In the narrative dimension, words evoke atmospheres hanging between the shadows of the road. And between the shadows, backlit atmospheres evoke environments. Environments which are mostly concrete, typical of Bluegrass State, farms, road’s edges, isolated taverns, distilleries, woods, hiding unreal mysteries in their corners. 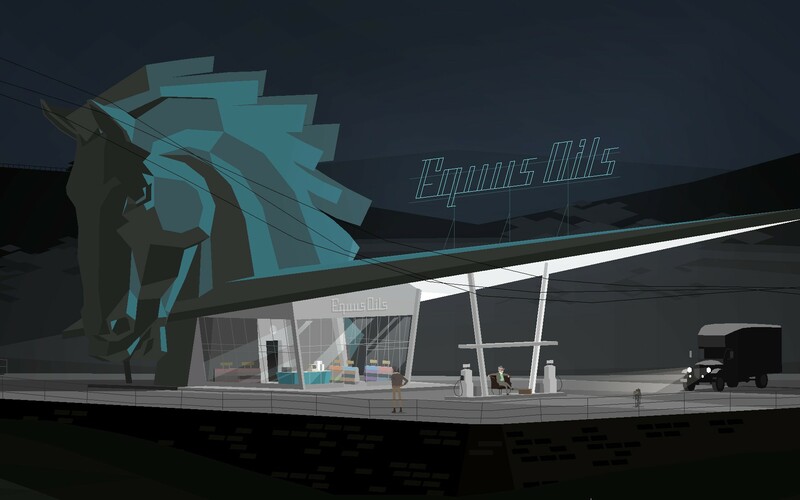 In fact, Kentucky Route Zero isn’t a textual adventure – luckily – and the graphic and sound structure is equally important. A truly perfect audio-visual synthesis: it’s like it can render the whole range of possible suggestions without any redundancy, everything is well-measured, nothing is too much but everything is precious and essential. Starting with character design: they are depicted through visual subtraction but, at the same time, very effectively characterized. But it’s obviously when it comes to the characterization of the environments that this game surprises the most. Environments are depicted in a theatrical way, through lights and planes slowly revealing new aspects during the itinerary. A minimalist expression extremely focused on detail, playing with shapes, with the unclear, with constrasts, grey areas, distance. Accomplice to this prospective plays, the automatic camera, which is the viewpoint, creating a perfected and suggestive cinematography, elaborating variations, rebuilding spaces, taking advantage of 3d without putting weight on stylization. 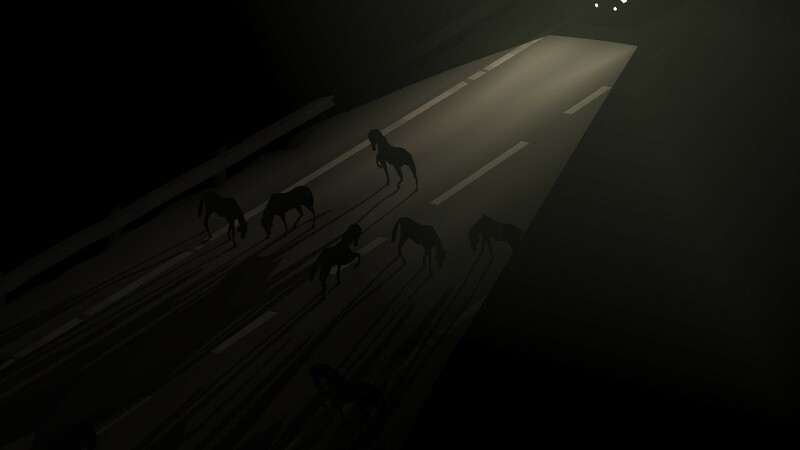 Kentucky Route Zero already represents the earliest example of a new style, gaining a number of followers among the last titles: I’m thinking to To Azimuth or Last Life for the visual choices, Knee Deep for the theatrical choices. I can’t help but see, in this respect, a parallel with Eric Chahi’s Out of This World iand the significance of his visual bet. 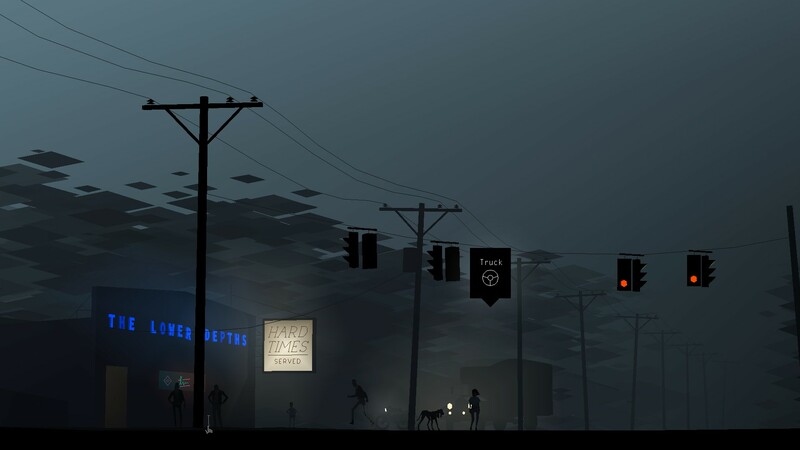 Kentucky Route Zero could have failed miserably, given its intrinsic ambition. But, despite the series still being unfinished (and it will remain like this for a long time, after how long it took for the first three episodes to get published), it already has won. Because what it manages to achieve looks to me like a new genre of animated interactive literature, the first step toward new ways of conceiving an interdisciplinary narrative. It can afford such an ambitious title because of its extraordinary quality, when it comes to writing and visuals, and poetic power. You can buy Kentucky Route zero from the official site kentuckyroutezero.com, where you can also download two minigames, The Entertainment and Limits and Demostrations, which add narrative elements to the main sequence of events. They also are an ulterior experiment of interactive narration. The Entertainment offer a theatrical piece, impersonating one of the actors on stage and creating a rather interesting experience (the version is made for using oculus rift, and it’s also possible to buy the script on paper). Limits and Demostrations is a modern art retrospective in which it’s possible to interact with the odd pieces. In conclusion, a little piece of advice: in the mines, lead the cart through the darkness.